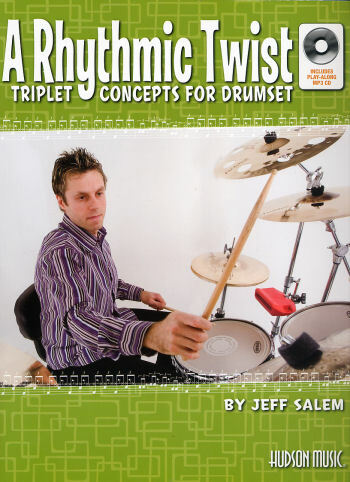 This book is basically for drummers who have grown up listening to straight-eighth-note-based rock, metal, and pop music and want to become more proficient when playing triplet-based grooves or styles. What Are Triplets: Includes triplet warm-up exercise. Includes 12/8 Grooves, Shuffles, Jazz, Hip-Hop, World, and Eighth-Note Triplets and variations plus lists of recommended songs to listen to for each style. A creative approach to triplet-based fills and grooves. Triplet grooves based on several styles including blues, shuffles, jazz, reggae, Afro-Cuban, New-Orleans, double bass and ghost note applications. Recommended Books and DVDs - Featuring Triplet-Based Grooves, Fills, and Play-Along Songs. Contains every example in the book demonstrated by Jeff Salem and play-along tracks in different styles that allow you to practice all the concepts you've learned. A great book and CD combination for anyone looking to learn more about the triplet-based grooves and fills used in R&B, jazz, hip-hop, blues, and Afro-Cuban music.